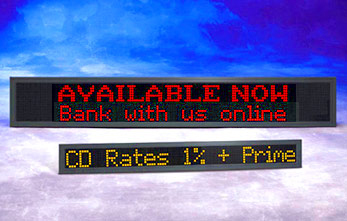 Compared to traditional methods of automobile advertising; newspaper, radio, TV, and outdoor billboards - ALPHAEclipse outdoor LED Signs are the most affordable way to advertise promotional programs to your targeted audience. Automobile dealers now have a new way to get the attention of the huge audience driving by their business every day - with an impact that only ALPHAEclipse message centers can provide. Advertise help wanted positions Advertise your important dealership messages at a moment's notice. Standard computer software is included to turn your PC into a convenient programming tool. Optional wireless devices enable easy installation with no need for complicated wiring. In remote locations, optional telephone modems allow you to communicate with displays. Advances in outdoor LED technology provide you with a virtually maintenance-free product. Superbrite solid-state LEDs last for over 100, 000 hours of continuous operation, and they consume less than 1/20 the power and significantly outlast comparable sized incandescent message centers. Indoor/outdoor Alpha message center system, the combination of both indoor and outdoor Alpha message centers create a new, moving, advertising medium that cannot be ignored. Once you have your customer's attention inside your business, close or cross sell to other dealership products with targeted messages exactly when and where they are need most. Also available are ALPHAEclipse Time & Temperature displays.